Why had we chosen a hog lagoon, perhaps one of the least appealing places in the world?There certainly are more desirable places to conduct scientific research. Concentrated livestock operations, “factory farms” (although not all of these facilities are large or factory-like) have a variety of tools to increase the efficiency and productivity of their livestock. The lagoons represent a simple, cost effective method for handling the abundant organic waste that hogs produce. These lagoons are not environmentally ideal. Although often lined with plastic, they still leak into the ground water, and, after a heavy rain (or hurricane), can overflow. Hog lagoons, rich in organic waste, are a breeding ground for bacteria, archea, and microbial fungi. This is particularly problematic, because another widespread livestock management strategy is the use of subtherapeutic antibiotics* to promote fast growth and efficient feed to meat conversion. These antibiotics find their way into feces, which is then stored in lagoons, where antibiotic resistant microbes evolve. 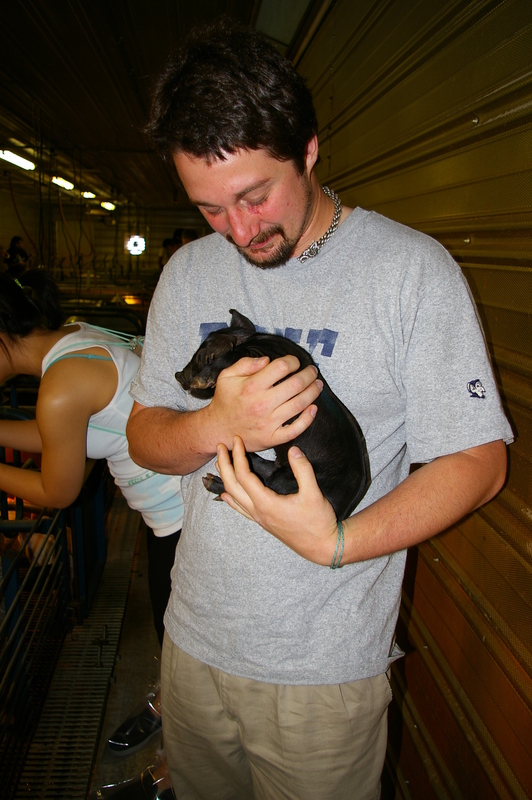 I'm holding a baby pig, your argument is invalid. Photographer unknown. Back on dry land, our team keeps their distance while hosing us off. The samples, still intact, are placed in a cooler for transport. We continue our tour of the farm, checking out the feeding operation, the birthing pens, and playing with day old piglets, before returning to the lab. Subtherapeutic doses of antibiotics are used to increase the growth rate, feed efficiency, and reproductive success in hog farms. Among the antimicrobial agents approved for swine are the antibiotics: apramycin, bacitracins, bambermycins, chlorotetracycline, lincomycin, neomycin, oxytetracycline, penicillin, tiamulin, tylosin, virginiamycin and the chemotherapeutics: arsanilic acid, carbadox, roxarsone, sulfamethazine, and sulfathiazole (Cromwell 2002). Bacitracin, lincomycin, neomycin, oxytetracycline, penicillin, and variations of sulfamethazine and sulfathiazole are currently used to treat infections in humans. Arsanilic acid, carbadox, roxarsone, sulfamethazine, and sulfathiazole are fungicidal. We return to the lab and begin isolating fungi from our hard-won samples. There aren’t any surprises, just the standard blend of microbial diversity, with some opportunistic and obligate anaerobes thrown in for good measure. From our samples, we isolated several different species, representing a decent swath of the fungal tree of life. Among those was a particularly abundant strain of Candida albicans, a common fungus most medical students would recognize. C. albicans is often commensal with humans, and occasionally extremely infectious. We plated out a few dozen colonies on culture media spike with various general fungicides, including various sulfa-drugs, and placed them in the incubator. Surprisingly, the mechanisms by which subtherapeutic doses of antibiotics act to increase growth rate, feed efficiency, and reproductive success are not well understood. Broadly speaking, antibiotics act to reduce metabolic demands, increase nutritional uptake, and control disease. A healthy, wild hog (and a healthy wild human for that matter) acts as host to a huge microbial community in their intestines – the gut microfauna. This community aids in digestion, outcompetes potentially infections microbes, and stimulates the development of immune defenses in the host. These benefits come with energy costs. In hogs, an estimated 6% of all net energy extracted from food goes directly to the gut microfauna; 23 to 36% of whole body energy expenditure goes to maintaining a healthy microbial community (Dibner and Richards 2005). In order to prevent infection and control the rate and location of microbial colonization, hogs rapidly turnover epithelial cells in the gut and continuously secrete a layer of mucus. This prevents the gut from being overgrown by microfauna and creates a constant turnover of both epithelial cells and the microbial community. The net result of this process is that nearly 90% of all protein synthesized in the gastrointestinal system is lost to cell turnover and mucus secretion (Dibner and Richards 2005). By creating a sterile swine (a pig that has been fed subtherapeutic antibiotics since birth and has no native gut microfauna), nutritional competition between the host and the microbes is eliminated. 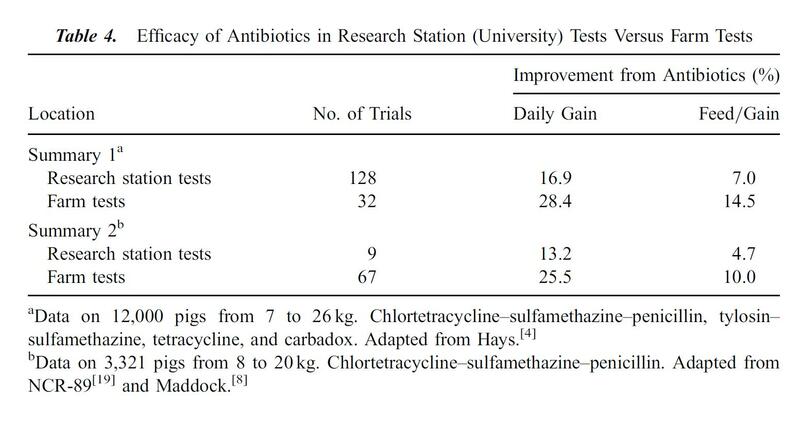 The following tables, from Cromwell 2002 illustrate the effects subtherapeutic antibiotics on hog farms. 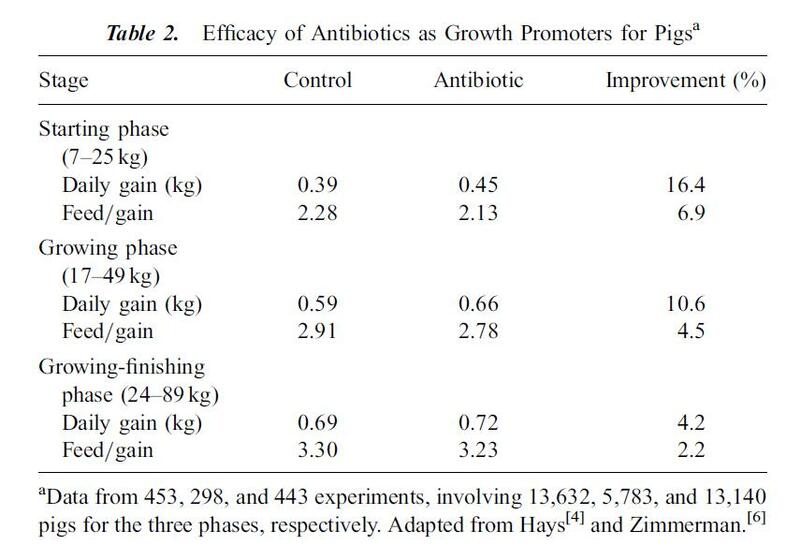 Table 2 shows the improvement in growth rate for hogs fed antibiotics over hundreds of experiments and thousands of pigs. Table 4 compares lab tests, which tend to be conducted in clean, laboratory settings, with farm tests, which tend to be dirtier with more potential for infection from the environment. Growth gains and feed efficiency from farm tests are even more dramatic than those from laboratory studies. I post these tables not to argue in favor of providing subtherapeutic antibiotic doses to livestock, but to illustrate the huge economic incentive for using these antibiotics. Approximately 70% of all antibiotics manufactured in the United States may be used to feed otherwise healthy livestock, represented by almost 25 million pounds. Ten million pounds of those antibiotics go to hogs. Back in the lab, we check the cultures every couple of weeks. About four weeks into the semester, several species had died off, but the Candida albicans was still growing strong. We re-isolated a few colonies, and transferred them to media with much larger concentrations of fungicide. These antibiotics accumulate in hog lagoons, where they are exposed to microbes not only native to hog digestive systems, but to microbes commonly found in the environment. The combination of abundant food in the lagoons and high levels of antibiotics creates an ideal environment to select for antibiotic resistance and promote the rapid growth of those microbes that thrive in such an environment. Antibiotic resistant microbes – “superbugs” such as MRSA – are already causing problems in hospitals and other places where antibiotic use is frequent, including farms. In one recent study, nearly a quarter of all meat and poultry produced in the US was contaminated with Staphylococcus aureus that was resistant to at least three classes of antibiotics. The semester is almost over and our fungal strains have succumbed to various fungicides. All but one. Candida albicans continues to grow. At this point we have exhausted the fungicides available to us through the medical center and have delivered doses exceeding 10,000X the recommended concentration. The students are extremely cautious when handling these vials and petri dishes. Some have opted out of the bench work involving this strain. Sealed in biohazard bags, we ceremoniously run those final samples though the autoclave before delivering them to hazardous material disposal. Recently, the US Food and Drug Administration has decided to halt plans to ban the use of subtherapeutic antibiotics in livestock. Industry lobby groups such as the National Cattlemen’s Beef Association claim that “[there] is no conclusive scientific evidence indicating the judicious use of antibiotics in cattle herds leads to antimicrobial resistance in humans.” The evidence to the contrary, however, is overwhelming. A collection of more than 100 scientific publications on the rise of antibiotic resistance from livestock production from 1969 – 2011 has been compiled by Pew Charitable Trusts. In 2005, the European Union banned the use of subtherapeutic antibiotics in livestock. I was an undergraduate during the great hog lagoon experiment, which was part of an advanced microbiology class, not a research program. I say this to make it clear that the outcome of this project was not only known in advance, but so predictable that you could design a course around it. The professor knew that we would, without fail, find antibiotic resistant microbes in the hog lagoon, in any hog lagoon, we sampled. *For convenience, I am referring to anti-bacterial, anti-fungal, and other chemotherapeutic drugs used to control the spread of microbes collectively as “antibiotics”. Well, yeah, but they found them in millennia old ice cores too, so I would expect them. But that raises an interesting question: do you see the same thing in organic hog lagoons? So what does this mean for the problem of antibiotic resistance today? Is this an old problem that is being blown out of proportion? Can we let the wanton use of antibiotics in modern healthcare and agriculture off the hook? Hardly. These conditions still create intense evolutionary pressures that favour the rise of resistant bacteria. The fact that resistant genes are widespread and ancient does not change that. It simply means that in times of need, beleaguered bacteria have a vast and longstanding range of defences to draw from. For every new sword that we fashion, there is a millennia-old shield lying around, just waiting to be brandished again. Keep in mind that it is a fungal species in this article and that it’s not just resistant to one anti-biotic, but to about six different ones, simultaneously. I don’t know of any studies on conducted on organic farms, but with no selective pressure to produce antibiotic resistance, I doubt you would find them in high abundance. 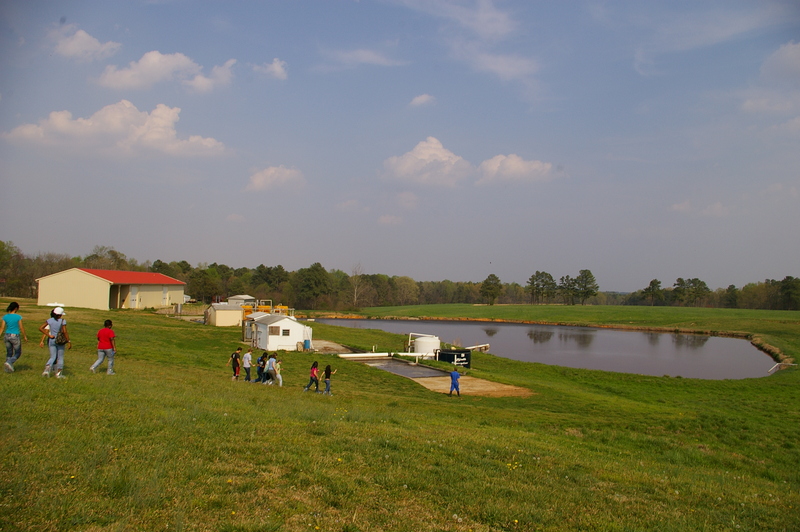 Organic standards require pasture or deep bedding for the animals, and North Carolina has additional regulations (and tight controls on the creation of new lagoons), so there’s less incentive for organic farms to employ lagoon style waste management systems. Well, yeah. But it seems like this would be a pretty straightforward study to do to confirm that this is related to the antibiotic usage. Wouldn’t that be handy data to have to show the FDA, and not particularly challenging to obtain aside from being in muck briefly? 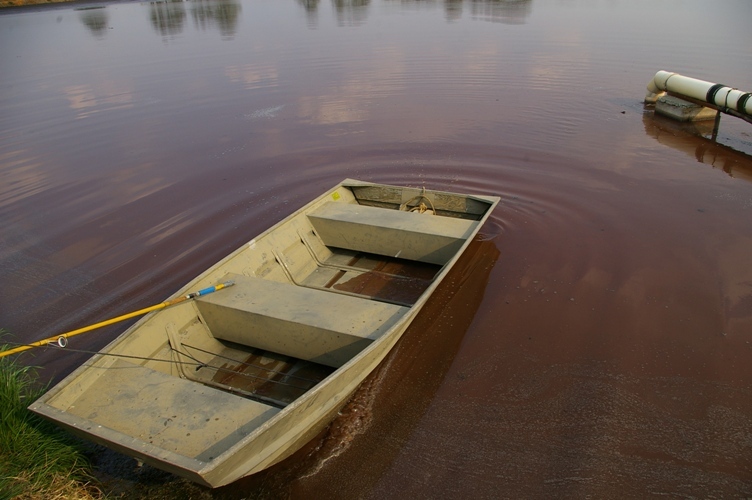 Most organic farms in NC don’t use lagoons. There’s no muck to compare. But, if you check through the list of papers in the article, there are multiple comparisons between antibiotic fed and antibiotics free livestock that show increased antibiotic resistance in the antibiotic fed groups, just not involving hogs in North Carolina. My own undergraduate research project involved well water and (human) sewage treatment lagoons, but fortunately, no boats. I had to go to some of your other comment threads to double check the icons used here. I mean, you hardly have time to read my comment above and already you want to plaster duct tape over my mouth? Let’s see how I do this time. The icons are randomly generated. Sadly, I have no control over them, but at least you got the skeptical eyebrow. If you want one more personalized, check the comment policy for instructions on how to make a Gravatar.